Nofima is one of 17 institutions chosen recently to become hosts for Centres for Research-based Innovation (SFI). The centre is to contribute to solving some of the main challenges facing the aquaculture industry, such as lice and mortality. It is to lay the foundation for the development of closed-containment concepts of the future. With greater control of the production process, it will be possible to reduce problems associated with mortality and sea lice, and to reduce the production time for farmed salmon. “This is part of the drive to take the aquaculture industry and the supplier industry onwards to the next generation,” says Nils Haga, Division Director at the food research institute Nofima. The next generation of aquaculture may see the introduction of a new stage in the production between smolt production in fresh water and ongoing phase in the sea. This is the postsmolt phase in closed-containment systems. Increased survival, and fewer problems with lice and escapees are the probable consequences of this postsmolt phase. The centre is to be called CtrlAQUA (Centre for Research-based Innovations in Controlled-environment Aquaculture), and Senior Scientist Bendik Fyhn Terjesen from Nofima at Sunndalsøra has been appointed director. Senior Scientist Harald Takle from Nofima in Ås will lead work at the centre into preventative fish health, while Lars Ebbesson of Uni Research in Bergen is to lead the work with fish production and welfare. The University of Bergen will have principal responsibility for research education at the centre. The total budget for CtrlAQUA will be NOK 196 million, spread over eight years. The Research Council of Norway has stated that the quality of the applications for the new SFIs was extremely high. There were 57 applications selected to participate in the final round. Senior Scientist Bendik Fyhn Terjesen is eager to start the next eight years’ work to develop the best biological and technological solutions. “We are delighted that we have been granted funding for research in this field, with innovation as its goal. We have a broad network of scientists, suppliers and the aquaculture industry in this centre, and all are eager and expectant,” says Fyhn Terjesen. A considerable part of salmon production in the future will be carried out in closed-containment systems on land, or in semi-closed systems in the sea. 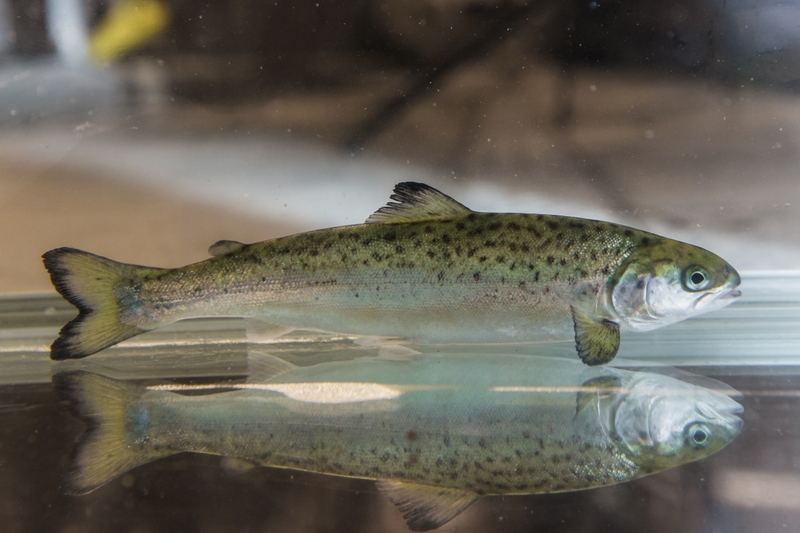 Experiments carried out by Nofima and its partners show that keeping young salmon longer in closed-containment systems than is customary at the moment gives better control of the production, which is beneficial for the fish. It also gives a dramatically lower mortality. “Based on the research we have already carried out, I believe that there is a basis to recommend continuing to hold the salmon in closed-containment systems with full control of the water quality, not disturbing the fish, until they are postsmolts that weigh well over 250 g. Fish then are significantly more robust than they are at 80 g, which is the size at which they are normally placed into open cages in the sea. More salmon will survive the open-sea phase,” says Fyhn Terjesen. The overall goal of the CtrlAQUA centre is to develop technological and biological innovations that can lead to closed-containment systems becoming a reliable and financially viable technology. The focus will be on innovations for the strategic periods in the salmon production cycle, such as the postsmolt phase. The centre will for this reason be able to contribute to solving the principal challenges for the industry, and will prepare the way towards sustainable growth as we approach 2050.